NSF’s newly launched mirror registration program has accepted aftermarket mirrors sporting blind-spot monitoring for late-model Chevrolet and GMC SUVs and the Toyota Tacoma. CAPA will do the same, following its December announcement of the Technical Committee approving a certified aftermarket mirror standard. However, the organization — which has suggested it is more rigorous than NSF, according to the Automotive Body Parts Association’s Body Language — doesn’t appear to have approved any of those parts as of May 1. This raises questions about safety and liability for the driver as well as the insurer and collision repairer selecting and installing these parts. The actual sensors that do the blind-spot monitoring work are elsewhere in the vehicle, but the light or other alert on the mirror can be what notifies the driver. While increasing vehicle autonomy can prevent a vehicle from merging into an occupied lane itself, that doesn’t change the driver’s responsibility — or liability — for being the person legally regarded as in control of the vehicle. If for whatever reason the alert isn’t conveyed, this could be disastrous for the driver and for the person who approved the part should. Unlike a nonfunctional turn signal, which should be fairly obvious to the driver and to the police (either it’s on when it’s supposed to be or it’s not), the absence of a blind spot monitoring alert would just indicate that there’s nobody in your blind spot — even if there is. Aftermarket electronics also raise questions about their ability to produce the proper diagnostic fault code — assuming OEM diagnostics are set up to monitor such systems, of course. 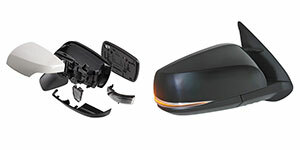 CAPA provided us with its December 2016 CAPA 701 standard, which in addition to requiring fit, function and compliance with Federal Motor Vehicle Safety Standard 111 for mirrors (which primarily deals with the visibility of what’s reflected) demands aftermarket blinkers meet the SAE J914 standards for side-facing turn signal markings and photometric testing. 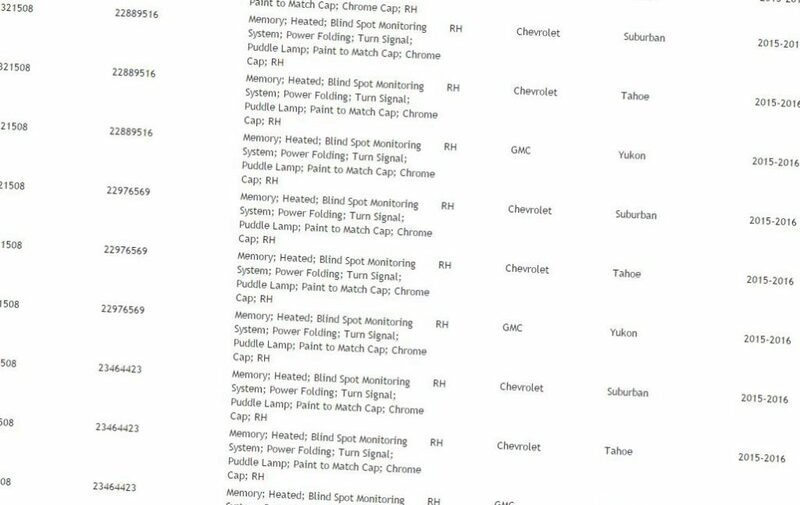 “The function of the blind spot indicator in the mirror is verified during the Vehicle Test Fit,” CAPA director of operations Debbie Klouser elaborated in an email. Asked Thursday about the idea that such safety features should be OEM-only, Klouser argued that redundancies were built into the system and CAPA was verifying functionality. “This registration allows companies such as Chris Cam and YY to demonstrate that an independent laboratory tested and evaluated their mirrors to determined compliance with federal regulations and also tested them for fit and functionality,” NSF wrote in a news release. As you know, NSF International has been offering certification of collision parts for over 7 years with great success. The demand for certification of certain part types has been higher than others. Voluntary registration provides a means for distributors, repairers, insurers and manufacturers to identify mirrors that have had their designs validated through testing to show they meet FMVSS 111 requirements as well as having been test fitted to a vehicle and tested for functionality. NSF International believes that registration offers stakeholders a means to identify mirrors that meet safety requirements. “When distributors, collision repair shops and insurers see a YY mirror with the NSF Registered Part mark they can be assured that the mirror meets essential requirements for field of view, reflectance and mounting in addition to meeting vibration and blind spot detection requirements,” Yuan Da Auto Mirror Industrial Company sales manager Flora Shih said in a statement. Insurers might shy from such parts anyway, based on recent comments from LKQ CEO Robert Wagman. Asked about how vehicle complexity would affect the aftermarket business, Wagman said that while aftermarket manufacturers could replicate lightweighted parts, insurers were refusing to use recycled or aftermarket sensors. It’s possible that caution might extend to the output for those sensors. 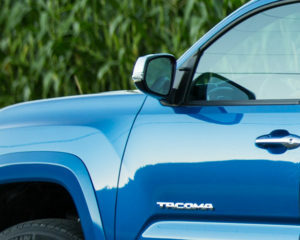 NSF’s newly launched mirror “registration” program has accepted aftermarket mirrors sporting blind spot monitoring for late-model Chevrolet and GMC SUVs and the Toyota Tacoma.